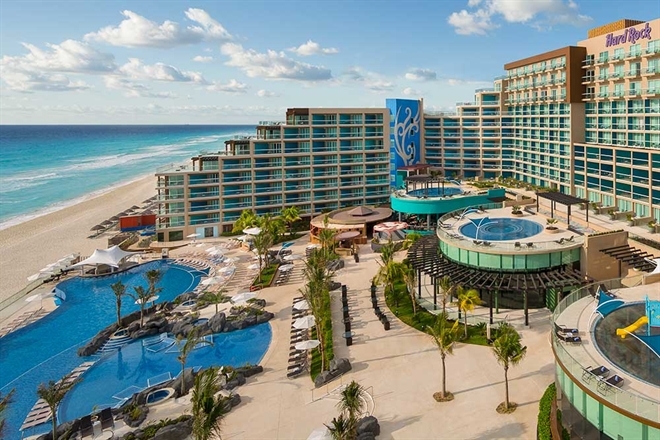 At Hard Rock Hotel Cancun, we've created the ultimate beachfront celebrity playground and transformed the typical All Inclusive vacation into a rock star paradise, which reflects our Mexican setting and cosmopolitan flair. From here on out you’re not on vacation. No, you’re on a journey through spine-tingling surroundings and crowd-pleasing amenities studded with style. 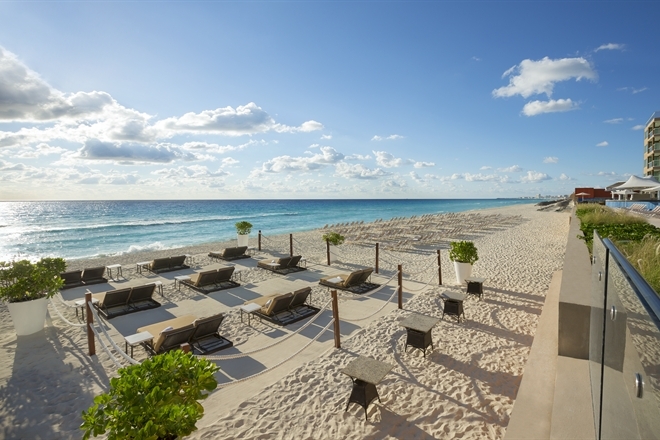 From championship golf to perfect beaches, Hard Rock Hotel Cancun has what you want and more. So kick back, because you’re about to kick it Cancun style. Hard Rock Hotel Cancun lavish rooms and suites are some serious rock star digs. Appointed with private balconies and personal hydro spa tubs, our spacious Cancun accommodations are a totally over the top experience. Enjoy Sleep Like a Rock® bedding featuring 300-thread count, Egyptian cotton sheets, plush bathrobes & slippers, and a personal liquor dispenser stocked with the good stuff to keep the party going. Perfect for accommodating every member of your entourage, family-style lodging provides special perks for your little rockers-in-training, including kid's menus, video games, and pint-size plush robes. For celebrities, there are no limits when it comes to demanding the best resort amenities. And if it's good enough for the A List, it's good enough for our guests. 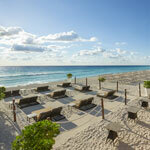 There are no limits at our All Inclusive Cancun resort when it comes to luxury dining, entertainment, and activities. Go on a world tour with the internationally inspired restaurants of the Hard Rock Hotel Cancun. Give meetings the rock star treatment. Plan the ultimate celebrity-style wedding. Rock out at the beach or the luxurious pool area with swim up bars. Indulge in a glorious spa day. 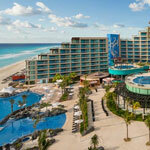 The Hard Rock Hotel Cancun truly has something for everyone. When you come to Hard Rock Hotel Cancun, you have a built-in audience of adoring fans who will cater to your every whim. Count on our exceptional staff and extraordinary luxury hotel amenities to deliver an endless variety of fun experiences, exciting entertainment, and indulgent pampering. 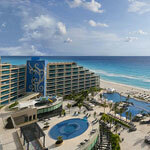 The Hard Rock Hotel Cancun truly has something for everyone. 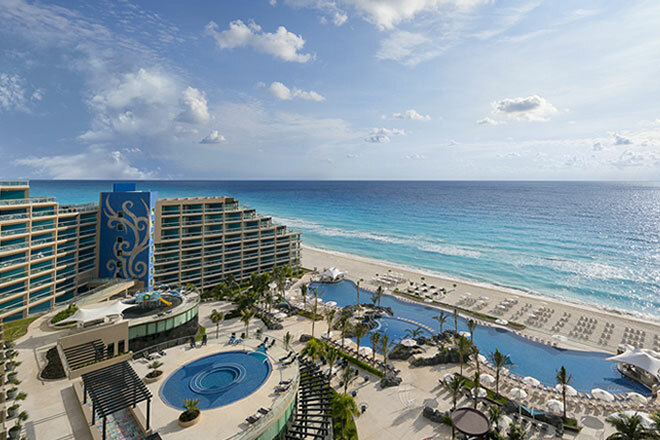 With service and style that knows no limits, Hard Rock Hotel Cancun took all the awesome of Rock & Roll and made it a vacation that has to be experienced to be believed. That means access to unbelievable All Inclusive amenities like experiential dining at 9 world-class restaurants, never-ending cocktails and in-room drinks from a personal liquor dispenser, legendary entertainment, and top-shelf everything across the board. It’s All Day. All Night. All Included, baby. We want you to have the decadent life in body, mind, and soul. Choose from a lavish menu of massages, facials, and body treatments at our spa that will transport you to a different state of mind. Perfect for winding down from a tennis match or simply setting the stage for a decadent tropical escape, the Rock Spa® features 10 individual treatment rooms, 6 couples treatment rooms, and a master spa treatment room with hydro spa tub. If you prefer to have your treatment outdoors, select an air-conditioned palapa style room, available for both couples and individual services.We want you to have the decadent life in body, mind, and soul. Choose from a lavish menu of massages, facials, and body treatments at our spa that will transport you to a different state of mind. Perfect for winding down from a tennis match or simply setting the stage for a decadent tropical escape, the Rock Spa® features 10 individual treatment rooms, 6 couples treatment rooms, and a master spa treatment room with hydro spa tub. If you prefer to have your treatment outdoors, select an air-conditioned palapa style room, available for both couples and individual services. Open daily from 6AM to 10PM, our Body Rock® Fitness Center features all you need to stay active during your stay. Get moving with classes scheduled each and every day with expert instruction, professional equipment, and world-class facilities. Get ready for a night out and unleash your inner diva with a full setlist of treatments at the Posh® Beauty Salon. Enjoy never-ending service from our professional and well-trained staff as we take your style to the next level of Rock & Roll glamour. After all, you’ve arrived. Now it’s time to enjoy. Prepare for some serious relaxation with full food and beverage service alongside the exotic outdoor pools. With two swim up bars, our expansive lagoon-style pool features a kid-friendly wading pool, thrilling water sports, and three outdoor hydro spa tubs including an adults-only tub to for the ultimate in relaxation. Tee off at the world-class golf courses of Cancun. Call upon our professional staff to confirm tee-times, arrange lessons, and help with club rentals. Then take advantage of the lush, tropical greens of Cancun's finest courses. At Hard Rock Hotel Cancun, there’s something for everyone. 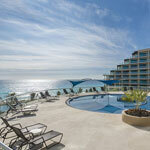 Step up to the Hard Rock Hotel Cancun and enjoy. That’s all there is to it. 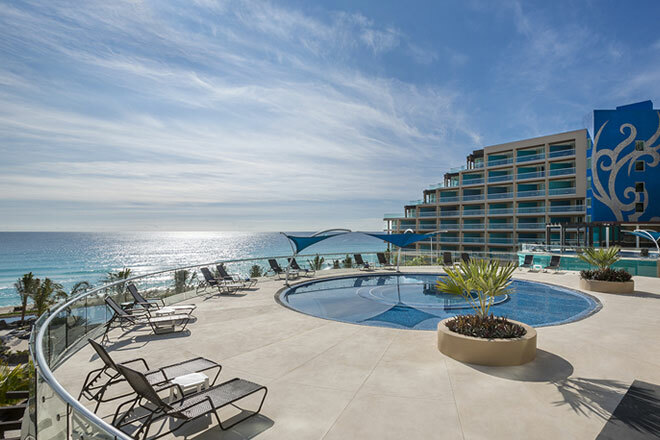 Set against the sparkling turquoise ocean, our beachfront resort offers a water-filled paradise of exotic fun for all with lagoon-style pools and kiddie pools, water slides, and full service. Enjoy pool volleyball and basketball, daily water activities, and more. We've got stellar recreational amenities and endless things to do at the Hard Rock Hotel Cancun. Hit the tennis courts by day or play basketball at night at our lighted court. Go for a run on the beach or around the property. Our concierge can give you the inside scoop on staying active at the resort and arrange all of the details. If you're just in the mood to workout, get your sweat on at our Body Rock Fitness Center. The state-of-the-art gym has everything you need to achieve that rock star physique, including cardio and weight equipment accented with one-of-a-kind priceless music memorabilia.